Not one to stand still, Sven has now launched "The Experimental Spirits Company", with plans to release a range of...well, experimental spirits. First up will be the "Smoked Bacon Bourbon", which "Dr" Phil Gandevia (the creation's "chef") gave us a little taste of on a recent visit to the Apothecary. 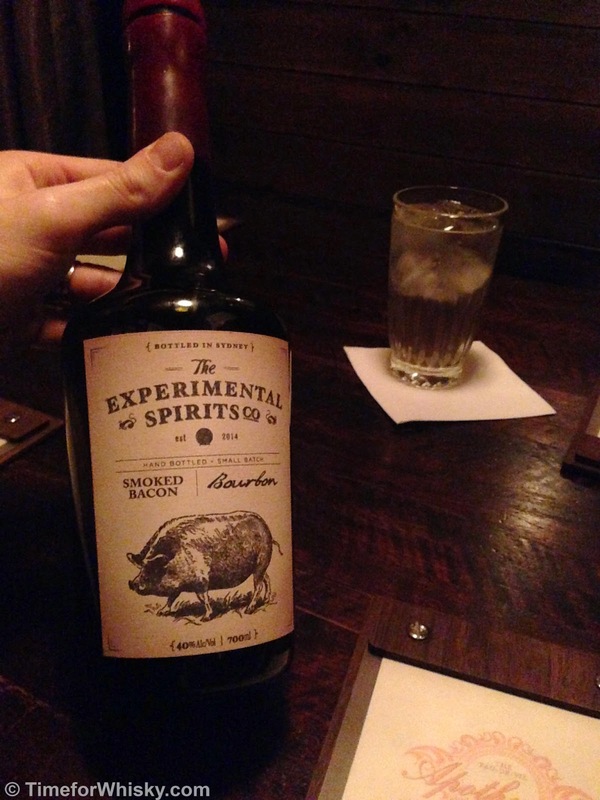 Having made my own bacon Bourbon a few years ago (which was OK, nothing special) I was interested to hear they use a whole 350gm of bacon per bottle and an onerous filtration process to ensure the product is both unique and tasty, but also fit for sale. This is hand-made (right in Sydney), small-batch stuff, but it ain't no home kitchen job. These guys are pros. Nose: Sweet maple syrup. Salty, but with all the hallmarks of a good, smooth sipping bourbon. Big vanilla notes to complement the maple syrup notes, and no clash with the saltiness. Palate: Very sweet, very dry. Chewy, meaty, and really very smooth. Not as much salt as the nose, but enough to distinguish this from a regular Bourbon, without a doubt. Phil wouldn't give up the name of the distillery producing the Bourbon, but it's clearly a quality base product. Finish: Short, with a beautiful mix of sweet and salty. Rating (on my very non-scientific scale): 90/100. Great neat, great on ice, and no doubt fantastic in a number of cocktails. A worthy investment in our opinion, and one we've already funded.